Sometimes it's good as a girl to disconnect and find the time to join with your lady friends for tea. It's become more difficult since I moved to the farm to connect as many of my lady friends live in the city. However, we make the effort every few months to have a tea party. It's amazing really how somehow, over the mini-sandwiches and the earl grey, you find the answers to issues that have been digging at you like a stone in your shoe. The warmth, the support and the endless giggles leave you feeling on top of the world, and capable of handling anything. I suppose it's different for the men - I know the boys nights in our garage seem to consist mainly of beer, cards and not a lot of conversation. But I suppose in the end they do the same thing - they connect. Over the years children have been added to the mix, and this has added a delightful element. To see our children connecting with one another is truly precious. 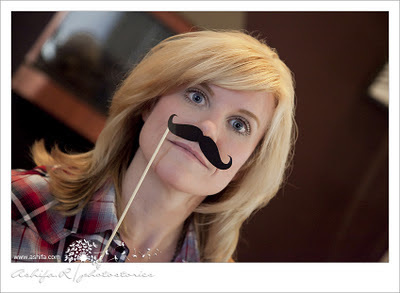 This month, we were celebrating Movember - and my very talented friend took some whimsical photos of us with moustache props. It added a silly side to our tea and bought a smile to our faces. I am quite certain that if faced with the issues of the world, a group of women could find solutions over a cup of tea.